Fresh from a week at the North Carolina coast, I returned in time for a new, exciting series at North Ridge; At The Movies. This series is taking several blockbuster hits, dissecting them, and discovering God within their message. First on the cutting table, one of my personal favorites, The Bourne Identity. In the Bourne series, Jason Bourne is a government agent with amnesia, trying to rediscover his true identity and not liking what he finds. Clues about his former life are confusing to him, contradicting his moral values and revealing highly specialized abilities. We each face our own identity crisis, a sort of spiritual amnesia, requiring us to discover who we are, why we’re here, and what we’re going to do about it. Some discover themselves easily, others take years to accept their identity, still others continually wrestle with it, creating a different identity for every situation. Every human’s identity is built off a common foundation, our creator. God, who knows every detail about us before forming our bodies in the womb (Jeremiah 1:5), is the basis of our individually unique identity. We are created to emulate Him, our act of worship that points others back towards Him. Until we embrace this truth, we will be in a constant state of identity crisis, cycling through endless personalities to try and find the right fit. Without this critical footing, however, none will match. On each side of the figure stands angled mirrors. These mirrors reflect the figure, as well as each other, replicating the figure infinitely in both directions. 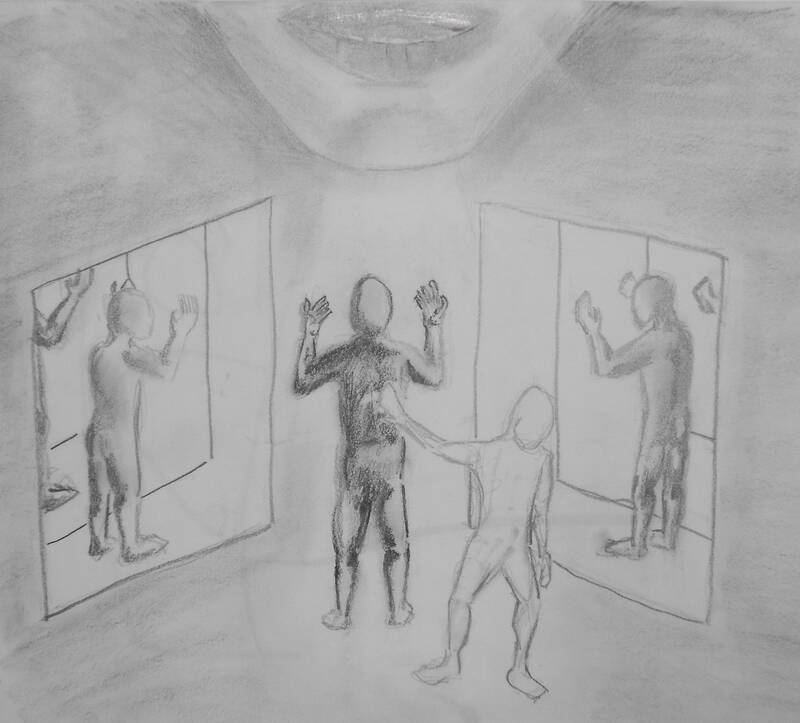 Up to this point, the drawing represents our identity within God. Life is breathed into each of us by God. Our true identity is revealed in giving that life back to Him, completely submitting to His direction. One remaining figure disrupts this breath-life-worship cycle. The ghostly white figure obstinately walking away from the central figure. This ghost represents an individual’s rejection of an identity founded in God through Christ, in search of a way to find themselves on their own terms. This figure remains hollow, without any depth from shading because our emptiness consumes us until we submit to our creator’s authority and allow Him to fill us.